A friend recently asked me about freezing oatmeal. She was concerned that her method of making steel cut oats ahead, and then freezing it in muffin cups for later use, may impact the nutrient level of the oatmeal. The minimal, if any, nutrients lost in freezing cooked oats for use over the next week or two, certainly does not outweigh the heart-healthy benefits of eating oatmeal on a regular basis! In addition, while steel cut oats are less processed (all oatmeal comes from oat groats – steel cut are chopped oat groats, usually chopped to the size of small seeds) there’s no real nutritional difference between steel cut, regular oats, and quick oats. Steel cut oats have a different texture which is more satisfying to some, but while they are ‘chewier’ they provide 4 grams of fiber per 150 calories, just like regular oats. Note: Quick Oats are not “Instant Oats”, which are more highly processed after flattening into flakes – they are chopped, pre-cooked, and dehydrated. In addition, sugar and salt is added. While they may be convenient to have on hand for travel or backpacking (look for lower sugar varieties), a better day-to-day choice is Quick Oats with a small amount of sugar added if you like. Steel cut, regular oats, and quick oats, are all great heart-healthy, high fiber (4 grams per serving), low sodium (0 sodium) breakfast choices. Eat whichever you enjoy most. Steel Cut oats offer similar nutrition (fiber, protein, fat, iron) to regular oats, but have a different texture and longer cooking time (about 30-35 minutes). Regular oats have similar in nutrition to steel cut, but can be cooked in the microwave in 2-3 minutes, or on stove top in about 7-8. The “old fashioned oats” are made by steaming the oat groats, then flattening them with rollers, which creates “flakes”. “Quick oats” are rolled even thinner, which allows them to cook faster. Check with the Whole Grain Council for more information on grains and oats. In the meantime, consider my friend’s tip for making your mornings quick and easy! On the weekend or your day off, cook 6 servings of steel cut oats according to package directions. In the morning, take out one oat “muffin”, place in microwave safe bowl, and microwave for 2 minutes or until soft. Add low fat milk, chopped nuts, fresh berries or bananas and enjoy! 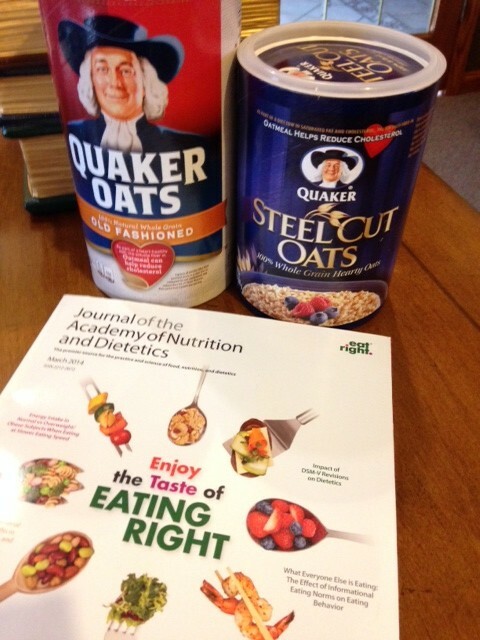 This entry was posted in Food Facts, Heart Disease, Misc and tagged heart healthy, low sodium, National Nutrition Month, oatmeal, oats, steel cut oats, whole grain council, whole grains by Rosanne Rust. Bookmark the permalink.